Michiko Yamamoto, Blossom in Alarm &ndash; Global Warming II, oil on canvas. A degree from the School of Fine Art, History of Art and Cultural Studies will provide you with the skills and experience for a successful career. You will graduate as a thoughtful, lively, critical and creative thinker with the knowledge and capacity for high-level enquiry in your subject. The aim of the School is not just to furnish you with a degree in your subject area, but also to enable you to become independent and well-rounded individuals who, equipped with a whole range of transferable and critical skills, have the confidence and experience to become successful in your endeavours beyond university life. Our graduates have an excellent reputation within industry and the 2018 High Fliers report ranks Leeds as one of the top 10 universities most often targeted by Britain’s top graduate employers. Many of our students also stay on at Leeds for postgraduate study to further their knowledge in their subject or choose to study in another School to specialise in a different topic. We count among our alumni many successful artists and writers, including Threadneedle Prize (2013), Mercury Prize (2012) and FUAM Graduate Art Prize (2016, 2017) winners. A large number of our students choose to stay in the region and either work for organisations, often in the arts, or develop their own entrepreneurial opportunities, including setting up artist groups and studios. We hold a range of events in which we invite our alumni to speak to students and lead workshops, to give a first-hand account of the wide range of future job possibilities open to our students. Find out more about our alumni in our news pages. We are committed to developing your employability and career prospects. All of our courses offer the option of a bespoke careers preparation module, which prepares you with not only subject knowledge but also transferable research, argument, analysis, communication and time management skills. You will also have opportunities to broaden your knowledge and skills by taking discovery modules from subject areas across the university. Our award-winning University Careers Centre offers support and advice to help prepare you for life after graduation, and has experienced advisors and strong relationships with graduate recruiters. The Careers Centre will help you right from the start and provide support after you graduate. industry talks, panels and workshops. The Bigger Picture is an annual event offering expert creative careers advice to final year undergraduate and taught postgraduate students in the School. It includes industry panels with alumni, workshops including interview techniques, advice on freelancing and CV tips. Speakers include artists, designers, editors, fundraising experts and more. Our optional study abroad year and work placement year offer valuable experience and skills to help you in the competitive job market. Wider learning opportunities include study trips, curation projects, talks by visiting artists and researchers as well as showcases and conferences. You can also get involved in Leeds University Students’ Union work or act as a student ambassador in the School or University. 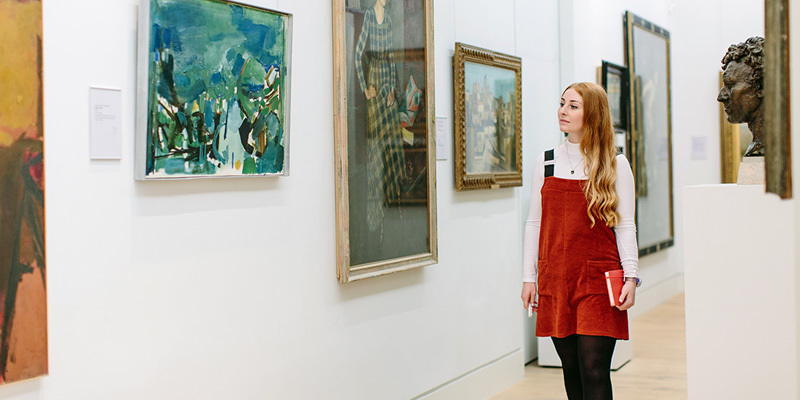 Other types of experience and opportunities can be found in the wider city environment, including artists groups, volunteering in schools, internships in museums and galleries, work placements, and many more. Leeds for Life is a digital platform which supports your extra-curricular and more long-term career planning.